Well, if no one visits your website, then no one will find out about your cause, which means no supporters. And having no supporters means no fundraising! Therefore the more successful your fundraisers will be! By using the ideas and suggestions I give on these two pages, and by always being as creative as possible, you will be able to market your site in a very cost effective way. In fact, with a bit of creativity and concentration, your fundraising site's marketing can cost you nothing at all. Which is what I hope your goal will be! Using traffic from the Search Engines is the best way of providing free visitors to your fundraiser website. By letting people find your website naturally when they search for things related to your cause. Ex. You're a children's home with a page about child care and someone searches for 'child care'. Please note: If you already know how to use the search engines and how to submit your site to them, you can skip this section and go straight to the other marketing ideas in part two of your fundraising site's marketing. But now you need to actually let the SE's know that you exist or else you won't be listed in their search results. There are four major search engines to submit your site to… Google, Bing and Ask. Submit your fundraising site's URL to Google through https://www.google.com/webmasters/tools/, follow their guidelines and remember to also submit your sitemap which will help Google find all your pages. Some web hosts, like mine, automatically build a sitemap for you and if you're lucky, like I am, they will also inform the SE's every time you publish a new page. So keep this in mind when choosing a webhost. With Google, if you don't have an account with them you will need to open one before you can submit your site. The process is very simple and also free. Bing and Ask work a bit differently and you submit your sitemap to them directly through your web browser. You do this by copying their submit page URL into your address bar followed by your sitemaps URL. For Bing you need to include the 'http://' from your Sitemaps URL before the 'www', but for Ask you have to leave out the 'http://'... They have to make things complicated, don't they?!? You should submit your site as soon as you have the home page up. Reason being that it will take a short while before the SE's index it. Also, please contact your web host to find out how to set up a sitemap with them, it is very important you have one. You will also want to get your pages to rank as high as possible for their keywords to increase visitors to your site. Please refer to the SEO page to find out how to do this. Another great way of increasing visitors from the search engines is by writing pages that provide 'searched for' information that is closely related to your organizations theme and purpose. It's a process called CTPM (Click to find out more)! We'll use the above example of a Children's Home again. There will more than likely be many people searching for information on taking care of children, i.e. child care. So you write a page about child care on your fundraising site, which gives great advice and tips on the subject, using examples from your children's home and your own experience. And then you end off with a brief description of your organization and the great things you're doing, as well as informing visitors of how they can help out. You have another webpage that can be found at the SE's by people interested in the subject. They then read the great advice you've given, which pleases them as their wish or desire is fulfilled. They will then begin to like you and appreciate the info you've given. And this, as they read about your cause, will make them more willing to help out and get involved. 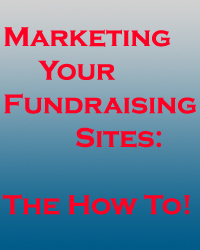 An excellent way of marketing your fundraising site hey!!! Let's go through to the second part of marketing fundraising sites and find out what the other innovative ways of marketing are. If you do have any fantastic marketing ideas or come up with any, please be sure to share them here at the "Your ideas for marketing fundraising websites" page. Remember, before you can expect to receive, you must be willing to give, and giving doesn't always mean money. So share your thoughts and ideas, and let's build a helpful and sharing fundraising community! Ready To Start Fundraising Online? Then you'll want to setup a FREE online fundraising and donation page to start receiving donations (today).